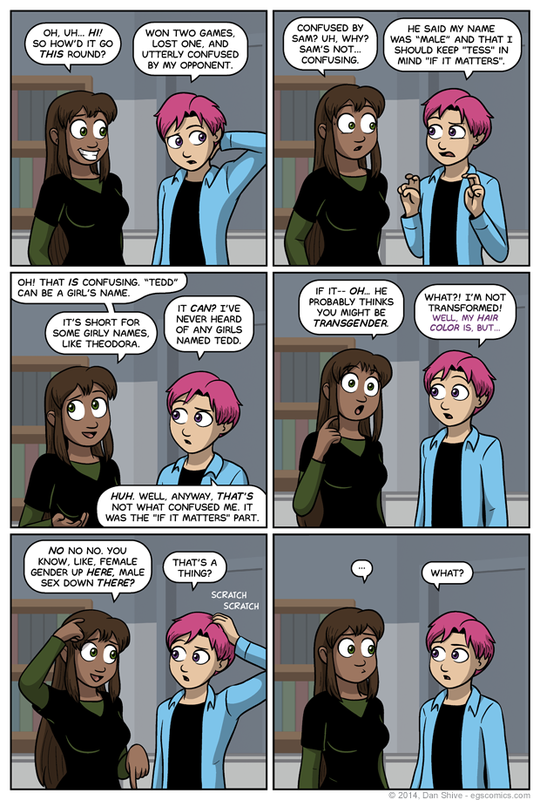 Grace's defnition in panel five is an oversimplification and specific to what she's assuming Sam thinks about Tedd ("Transgender" can refer to many things). Just wanna make my awareness of that clear. That said, if I do make some manner of terminology mistake or something at some point, feel free to politely yell at me. Side note on the subject of panel five: I think Grace is cute in it. I had never heard of "Tedd" (or "Ted") being a feminine name prior to bringing up the assumption that it was a male-exclusive name in the comic. Since then, I have learned that it can be short for several feminine names, but it's apparently common for people to not be aware of that. End result: It's not a plot hole for characters to not realize it can be a girl's name, but it would be a jerk move to not point out that it can be now that I know better. As an added bonus, that fact has given me certain ideas that I will not elaborate upon at this time.